Who was the main driver of the decision to seek litigation financing — the client or outside counsel? What was the strongest motivation for doing so? What are the major obstacles to adoption? What are the major challenges to the continuing growth of the field? Keep reading for findings from our research. Do you have FIRSTHAND EXPERIENCE working with a litigation finance firm? 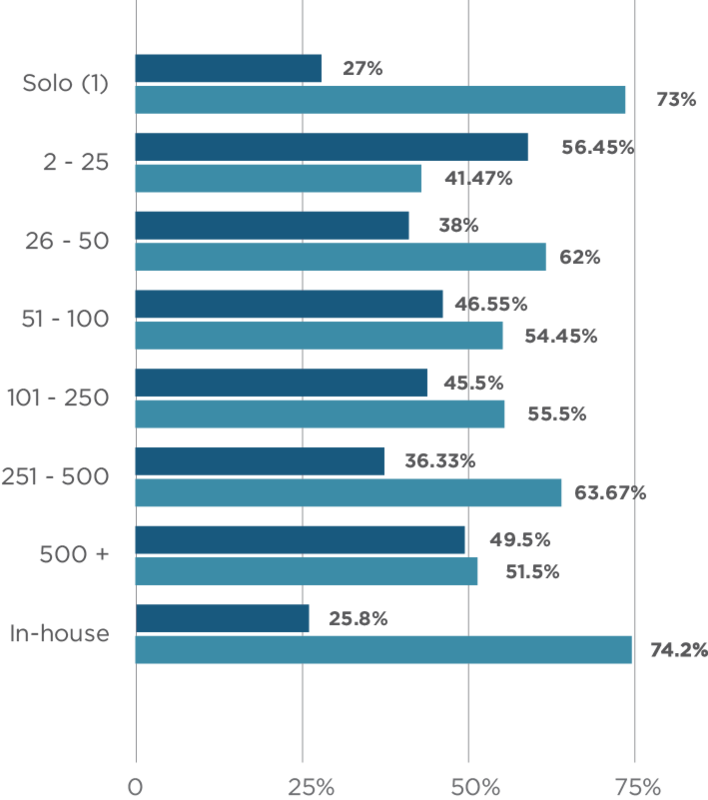 Consistent with earlier findings, the largest proportion of firsthand experience with litigation finance (56.45%) was reported by attorneys in the smallest (non-solo) cohort of firms (2-25 attorneys). The next-largest proportion of firsthand experience was concentrated among attorneys at the largest firms (500+ attorneys). Litigators whose practices concern the Energy and Telecommunications industries were the only respondent cohorts with a majority proportion of firsthand experience, though litigators in the Technology, Automobiles, and Life Sciences/Healthcare industries all reported a nearly 1 in 2 ratio (each 49 percent plus) of firsthand experience as well. 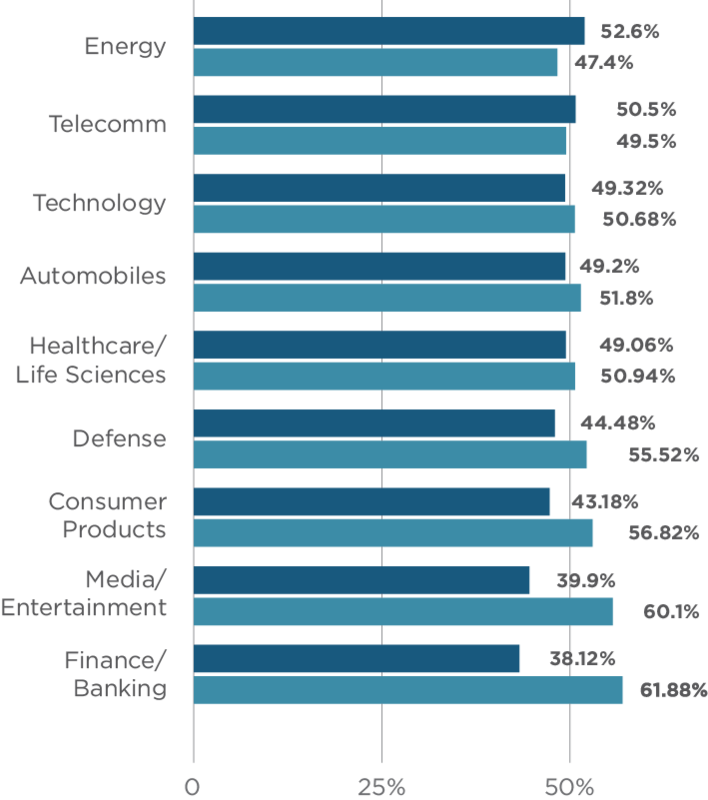 Litigators in the Finance/Banking and Media/Entertainment sectors had the lowest rates of firsthand experience. 1As indicated by responses to the question “Does your practice concern any of the following industries?” accompanied by the (obviously non-exhaustive) menu of the nine industries listed above. Multiple selections were permitted. Who was the main driver of the decision to seek litigation financing? In our earlier survey findings, we found an interesting divergence of perspective between in-house counsel and law firm partners regarding the main driver of the decision to seek litigation financing. This year, we see that divergence widening. In-house attorneys reported that general counsel/legal departments (i.e. themselves and their peers) drove the decision roughly 40% of the time (a 10% increase from 2016), with outside law firms being the main driver about 10% of the time (down more than 5% over our earlier finding). By contrast, law firm partners characterized outside counsel (i.e. themselves and their peers) as driving the decision about one-third of the time (up slightly from 2016), while general counsel/legal departments were perceived as driving the decision only about 7% of the time. What was the strongest motivation for seeking litigation finance? Consistent with our earlier findings, in-house counsel were the only category of respondent citing “As a means to fund operating expenses” in significant numbers, at 27%, up 2% from 2016. “Hedge risk of litigation” was a close runner-up as a motivating factor for law firm partners, at 35%, down just over 4% from our previous findings. How were potential litigation finance providers identified? What are the most important considerations in choosing a litigation financier? Law firm partners ascribed much less value to the financiers’ right to influence/decide litigation strategy than their in-house peers. 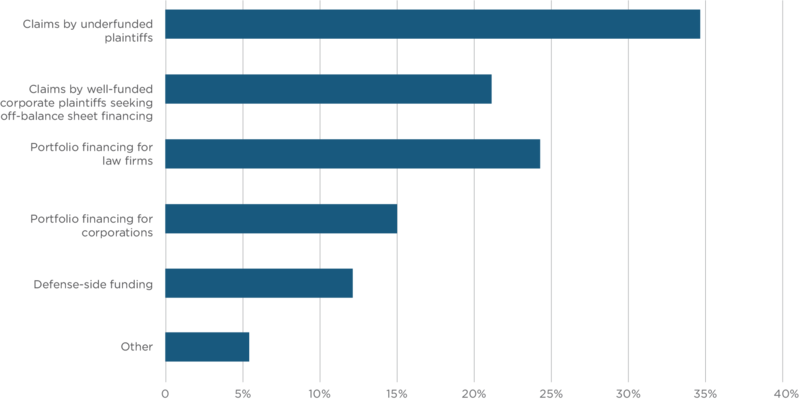 Specific subject matter expertise was considered significantly more important to in-house counsel. The speed and responsiveness of financiers was more highly valued by in-house counsel. Since our previous survey, we found that the average value assigned to the ascribed to the “speed/responsiveness” of financiers by in-house counsel jumped up markedly, from 4.9 to 3.8 in 2018. There was an essential consistency in perspective between the two groups when it came to value of flexibility and reputation of financiers. Would you use litigation finance again? As in our 2016 survey, more than 80 percent of respondents with firsthand experience with litigation finance stated that they would use litigation finance again, though the proportion of respondents answering “yes” to this question declined slightly – by about 3% – since our 2016 survey. In line with previous findings, this overall proportion was essentially consistent across all categories of respondent position, firm size, and industry focus. Law firm partners were most satisfied as a group (88% would use litigation finance again) and law firm associates were the least satisfied (75%). Would you recommend litigation finance to others? Similar to the previous – and related – question, this overall pattern was consistent across all respondent categories. The “No” cohort has increased by about 5% since our 2016 survey. Would you consider exploring litigation finance in any of the following circumstances? The proportion of respondents who would NOT consider litigation finance holds steady since our 2016 survey at about 30%. Why would you not consider using or recommending litigation finance? Approximately 59% of all our survey respondents did not have firsthand experience with litigation finance. Of that group, 30% declared that they would NOT consider using litigation finance. The most commonly cited reason for ruling out the possibility of litigation finance by 43% of negative respondents were “ethical reservations.” This proportion is significantly lower than in 2016, when roughly 70% of negative respondents cited ethical reservations. The second most common reason cited by respondents was “having heard negative information.” Thirty four percent of the “would NOT consider” cohort cited this as their reason not to consider litigation finance; this percentage is up by about 5% from earlier findings. What do you predict about the future growth of the litigation finance industry? What do you expect will drive the future growth of the litigation finance industry? Roughly one-third of respondents see claims by underfunded plaintiffs driving future growth, although about one-quarter view the growth of portfolio financing as most important. What do you view as the greatest future challenge or threat to litigation finance? What do you predict will have the greatest effect on litigation finance in the future? As with the previous question, potential ethical issues took the first position, followed by the rising influence of AI.